HomeBlogGooglePage 1 of a Google search result. The results that you see on page 1, according to Google, are the best pages that will help answer your search questions. Let’s take a look at each section of page 1. When you enter a search query into Google, the first thing you see are the number of “pages”…not websites…PAGES, that are known for a search query. For example, type in the word “graphic design” and you will see that there are about 11,590,000,000 pages that deal with the words “graphic design”. Take that in for a moment. 11,590,000,000 pages. That’s the pool of pages that your website page would be in if you wanted to rank on page 1 of Google for that query. That’s a quick way of determining what the competitive landscape looks like for a word or words you are trying to rank within. Try a few words, and note the search results number. 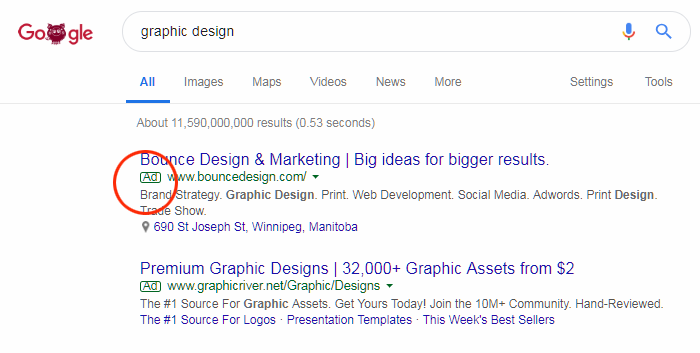 TIP: Picking a search string that has fewer results, is a more targeted approach to getting better positioning than a search string that has more results. It’s like reaching for the low-hanging fruit, its there for the taking. The next thing you will see on the page are the first 3 placements for Google Ads. See the little green rectangle with the word AD? Sometimes there are only 2, sometimes 3. But, either way, these are the results of companies that pay to have their web page listed here. There are Google Ads at the top of the page and other Google Ads at the bottom of the page. When you click on these results, Google charges the business a fee. It’s that simple. TIP: An improperly configured Google Ad campaign can cost you a lot of money, with poor results. If you want to learn more about how to run Google Paid Ads, just ask! In the next position, we have the businesses that are located near you. Google takes into account your computer or phone location and returns the closest results, and gives you the option to browse more places. 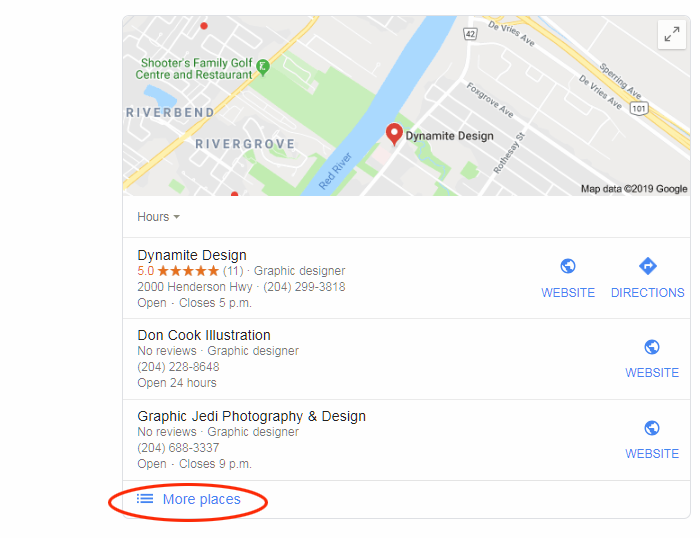 TIP: If you have not already claimed your GOOGLE MY BUSINESS location, you can do that by signing into your Google Account and setting that up. Now we have the organic search results, or in other words, these are the results that are here because the content of these pages answers the search query the best. 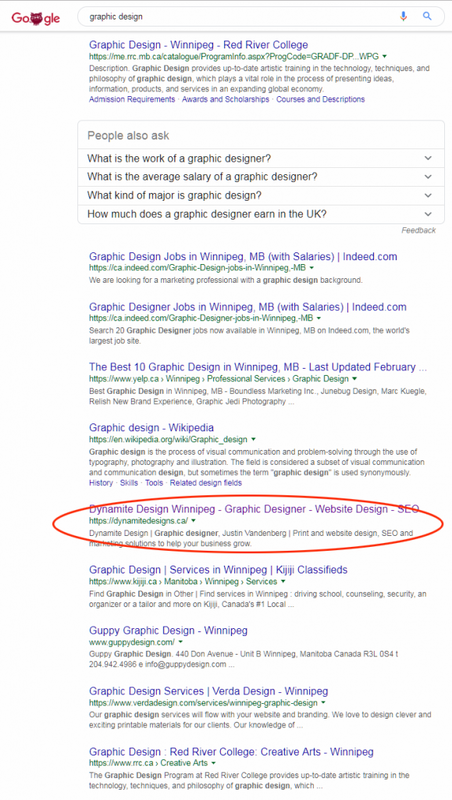 In this result you can see that there are results for a school that offers graphic design courses, followed by an employment site that offers jobs for graphic design, then Yelp, which is a large directory of business that offer Graphic Design, and then my business, Dynamite Design. You can see how the order of the results shaped up…the search term was Graphic Design and Google showed us the schools that offer Graphic Design, followed by employment for Graphic Design and then it drilled down to the businesses offering Graphic Design. That’s logical. TIP: See where it says PEOPLE ALSO ASK…that is the area that shows what people are typically asking. If you can provide a good answer to those questions, then your web page can rank there. Typically, you will see results in there from blogs, wikipedia and other resourceful websites. BIGGER TIP: When you blog about a subject, or question, make it as broad as you can so that your answer is relevant and useful…landing you a better chance of getting your information there than your competition.